Anchor Bay Beach is a 1/2-mile-wide seasonal beach. “Seasonal” in that the sand comes in and goes out according to seasonal weather patterns. Its true placename is Fish Rock Beach, named for the bygone town of Fish Rock that disappeared in the 1920’s, but strangely, still appears on many maps. The popular local name of Anchor Bay comes from the tiny resort village perched on the terrace just above it. During Fair Weather. . .
New visitors to Anchor Bay often notice that, from here, the sun does not set over the ocean. When I point out to sea and tell them, “That’s south!” some don’t believe me until they get out their compasses. 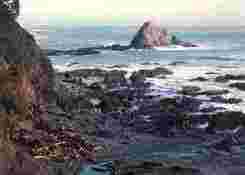 As a matter of fact, the whole coast from Point Arena to Bodega Bay faces toward the southwest. Anchor Bay is like a big bite out of the coast and faces even farther around to the south. It is our south-facing beach that accounts for everything interesting and wonderful about the place. 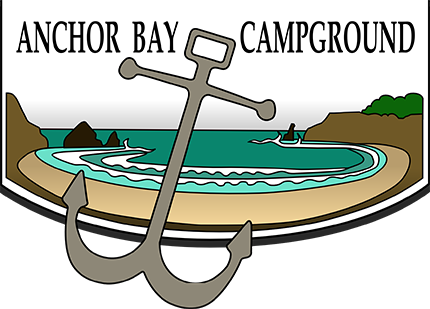 Anchor Bay is protected from the nearly-relentless winds that blow out of the northwest. It’s not unusual to look out and see solid whitecaps and giant swells moving on down the coast, passing us by. This area is known as Haven’s Anchorage, named in the 1853 coastal survey possibly after the captain of the vessel. Anchor Bay, then known as Fish Rock Landing, was one of the coast’s dogholes where schooners were loaded with tan bark and railroad ties from a chute on the west point. Our protected waters have continued to be a haven for today’s commercial fishermen far away from their home ports. They still find nightly refuge from rough seas while working salmon, rockfish, and urchins off our coast. I’ve seen as many as 175 boats anchored at one time. The combination of the coastal shape and the direction of the wind causes a climatic blessing called the Banana Belt, a nearly fogless micro-climate involving about five miles of coastline with Anchor Bay set in the middle like a diamond in a golden ring. While the wind blows onshore for the rest of the coast it is practically offshore here, keeping the fog from drifting in. North and south of us, summertime motorists are winding along Highway One through the dripping gray, trying to pierce the fog with their headlights, while we bask under clear blue skies. The fair-weather ocean swells of spring, summer, and fall approach the California coast from the northwest, having been generated hundreds of miles away in north-Pacific storm cells. Our prevailing winds, also out of the northwest, help to push them along and encourage them into good size. They break directly onto west-facing beaches such as at Manchester Beach and Gualala Point with all the energy stored in them. While Anchor Bay is spared the direct impacts, the swells do manage to wrap around shallows and points of land and work their way into the bay, but not without going through a maze of softening effects. First, there are obstacles like the peninsular shores of Haven’s Neck and the islands of Fish Rocks that block their approach. Then there is energy loss as they stretch themselves around corners. Even more energy is absorbed by sheltering kelp beds. After being broken up, spread thin, and drained of power, the swells are a fraction of their former potential. 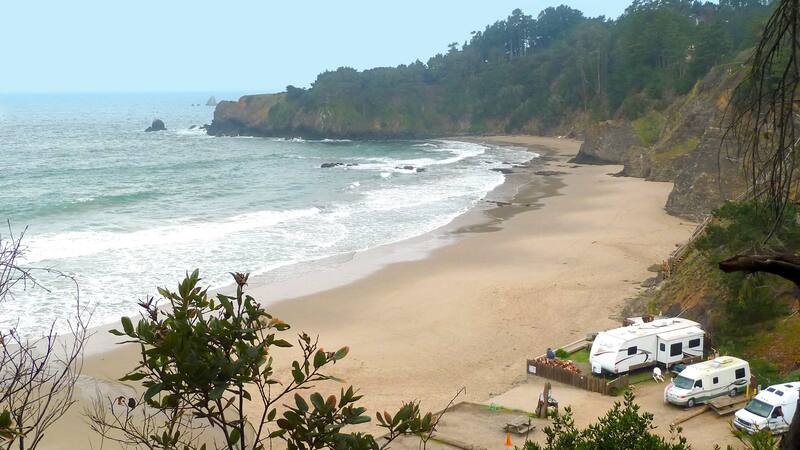 They may be breaking 10 feet high on Gualala’s beach but only 1 or 2 feet high here. Anchor Bay’s most attractive feature is its white sand beach. While most of the north coast is dominated by high cliffs with boulder and cobblestone beaches at their feet, sand collects in pockets like river and creek mouths and in coves whose shapes persuade currents to deposit rather than to sweep clean. Anchor Bay is a perfect sand trap. When the swells are far apart, as happens during fair-weather, there is a shoreward movement of sand as it is constantly, gently lapped in the one direction. Close to shore, the lightweight grains are suspended in breaking waves and carried up the beach. The grains fall out of suspension by gravity and join the bottom. Later, during low tide, the drying sand loses its adhesion, and the grains are picked up by gusts of wind and moved further up the beach. In this way, the beach builds up day by day, week by week, month by month. During storms, the protection of the south-facing beach is lost. Wind and waves shift around the compass to come out of the south and southeast. There are no points of land or islands to block their approach, and Anchor Bay is hit directly with the full force of the open sea. A wave will begin breaking beyond the wash rock just outside of the bay (about 100 yards out) and before it reaches shore another forms, then another, and another, until five lines of surf will be sweeping shoreward in a deafening rumble. When high tides and storm winds combine, waves sweep across the whole beach to the cliff bottoms, over the sea wall, and up into the gulch. Spectacular changes occur to the beach when nature rages. Summer’s whimpering creeks become voracious torrents that gouge out tons of sand. Rafts of driftwood trees and stumps are piled like kindling. Whole kelp beds are ripped from their reefs and cast ashore with some kelp holdfasts still clinging to chunks of rock. The agitation is so great, tons of suspended sand have no place to settle except in the deeper water beyond the reach of the boiling breakers. The white sand beach that took months to build up can be removed in a single storm. After the sand is gone, Anchor Bay’s winter beach takes on the appearance of the rest of the exposed-coast shingle beaches. 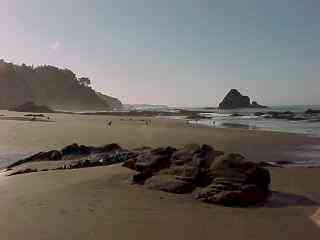 Now huge rock outcroppings dominate large sections of beach, some towering several feet above your head, rocks that lay hidden beneath the summer sand. Boulders, cobblestones, and pebbles lie in sorted arrangements around log and sea weed sculptures. A few places are clean down to the bedrock whose surface has been ground to an amazing smoothness, evidence that the removal of the sand was but a single pass of Nature’s polish cloth, and that a million such passes have occurred. It stands as the guarantee that the sand will return in season, just as assuredly as the sun will rise each day.